Sen. Heather Somers and Sen. Art Linares at the January meeting. AREAWIDE — On Jan. 11, Sen. Heather Somers (R-18th) and Sen. Art Linares (R-33rd) attended the first 2017 meeting of the Connecticut General Assembly’s Higher Education and Employment Advancement Committee. The panel has oversight of all matters relating to the Board of Regents for Higher Education, public and independent institutions of higher education, private occupational schools, post‑secondary education, job training institutions and programs, apprenticeship training programs and adult job training programs offered to the public by any state agency or that receives funding from the state. Somers, who serves as the committee’s Vice-Chair, represents Griswold, Groton, North Stonington, Plainfield, Preston, Sterling, Stonington, and Voluntown. 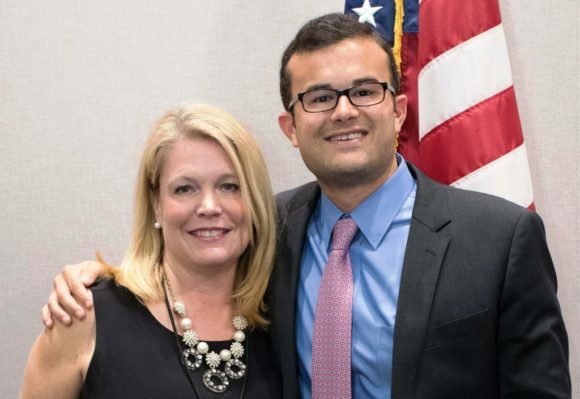 Linares, the committee’s Co-Chair, represents Chester, Clinton, Colchester, Deep River, East Haddam, East Hampton, Essex, Haddam, Lyme, Old Saybrook, Portland and Westbrook. Somers (www.SenatorSomers.com) can be reached atHeather.Somers@cga.ct.gov and at 800-842-1421. Linares (www.SenatorLinares.com) can be reached at Art.Linares@cga.ct.gov and at 800-842-1421.